Congratulations! You’ve completed the marathon! Regardless of whether this is your first or your 51st Marathon, each one presents you with a different challenge and goal. So today you may find yourself walking backwards down the stairs and are struggling to get on and off the toilet. This is due to delayed onset muscle soreness or DOMS. DOMS is particularly noticed after eccentric muscle activity i.e. muscles controlling movement against gravity. Hence why it going downstairs and lowering to a seated position is a problem in the days post-race. The important thing is to let your muscles recover, give yourself three or four days of no running at all. On Thursday or Friday you can do a slow 2-3 mile run, if you are a seasoned runner you may do a little more but remember your body needs to recover. Follow your first run with a cycle or swim the next day. By the weekend you may be itching for a long run again but really no more than 6-8 miles at a very easy pace. Your 3 weeks following a marathon should follow your taper in the three weeks before the marathon but in the opposite direction ie little or nothing in the first week and then a slow ramp up. 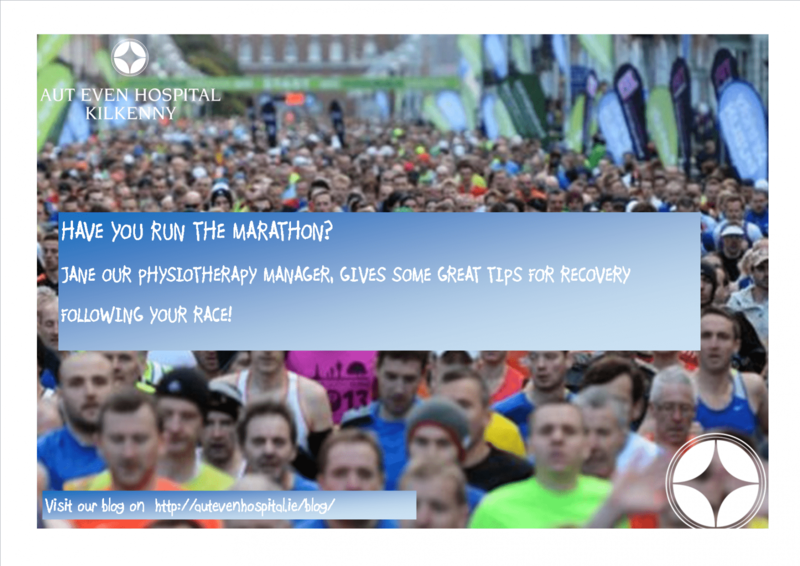 The suggestion is your body needs 3 weeks to recover following a marathon or one day for every mile you ran. Don’t worry you will not forget how to run or loose condition in this time! And remember you are only ready for your next marathon when you’ve forgotten about your last one!